SSN Crea-Pump Concentrate is a micro-concentrated preworkout supplement for increased energy and mental focus. Serious athletes and lifters train at intense levels to reach their fitness goals. This product has been scientifically designed to increase workout performance. Contains caffeine anhydrous which has long been used as an effective energy booster and to enhance mental focus. To increase muscle mass athletes need to consistently increase how much weight they lift. A blend of creatine gluconate, HCI and monohydrate provides better uptake and increases workout strength. BHB is the main ketone found in blood plasma when an athlete is on a low carb / high fat diet. Ketones are reported to provide more energy than glucose, reduce body fat and improve physical performance. SSN have included BHB Salts to the formula to increase BHB levels and training capacity. Arginine AKG has been added to promote Nitric Oxide (N.O.) production. An increase in N.O. improves blood-flow which gives a better ‘muscle pump’ during training and faster recovery. 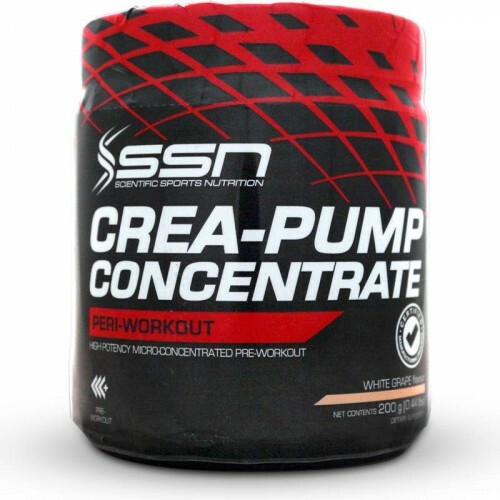 At the time of this review, SSN Crea-Pump Concentrate is one of the first preworkouts in South Africa to use the cutting-edge BHB Salts. Combined with the other innovative ingredients at an attractive price this is product worth trying. Other Ingredients: Beta Alanine, Arginine AKG, L-Citrulline Malate (2:1), BHB Salts, Creatine Gluconate, Creatine HCL, Creatine Monohydrate, Dextrose Monohydrate, Caffeine Anhydrous, Anti-caking Agent, Flavourants, Salt, Non-Nutritive Sweetener (Sucralose), Xanthan Gum (Stabilizer), Nicotinic Acid. Manufactured in a facility that processes Milk, Soy, Egg, Wheat (gluten), Barley (gluten). • Mix 1 heaped scoop (10 grams) with approximately 300ml of cold water or suitable sports drink. • Drink on an empty stomach 30 – 45 minutes before your workout. • The amount of liquid can be adjusted to meet your desired flavour intensity.